Chris Allen has been a member of the Folsom Lake Symphony since 2013, and joined the Auburn Symphony in 2016. 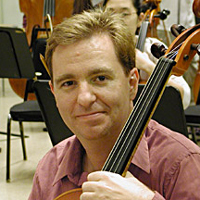 Before coming to our symphony, he was a student and alumni member of the UC Davis Symphony Orchestra for over 30 years. He also is a chorus member of the Sacramento Choral Society and Orchestra. Chris graduated from U.C. Davis and went on receive a Master of Science degree at UC Berkeley in library and information science. He is a software architect for California Department of Resources Recycling and Recovery (CalRecycle), and has taught evening classes on web development and programming at California State University at Sacramento.